Darasuram is located near Kumbakonam, Tamil Nadu. 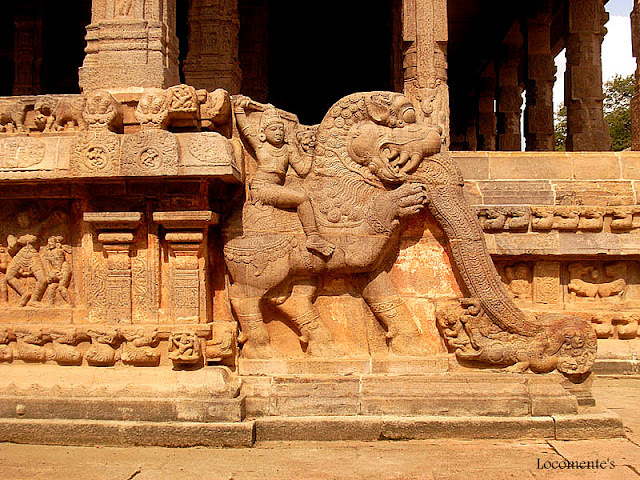 The Airavateswarar temple was constructed by the Rajaraja Chola-II in the 12th century AD. The front mandapam is carved in stone, in the form of a huge chariot drawn by horses. According to the legend, Airavata (White Elephant) is said to have worshipped the Lingam. Hence, the deity is named after as Airavateswarar. It is also believed that Yama (Lord of Death) has also worshipped the Lingam while suffering from a burning sensation all over the body due to Rishi's curse. When there was no technological advancement human hands with relevant tools only have built this.Wonderful.Thank you ,Satya for sharing here. Beautiful structure with amazing carvings. Wonderful that they have survived more than 800 years.